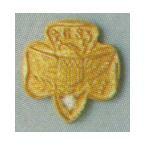 Appreciation pins are awarded to adults at the council level, following established guidelines. could not be an active member. but this requirement was later dropped. 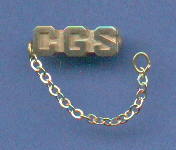 The "GS" on the pin was added in 1933. Early versions do not have GS on them. on the shoulders of the uniform or both. They came in bronze (common) with black paint and silver. 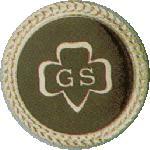 1949 cost of a pair of GS emblems - 50 cents. Currently for truly outstanding service of a Girl Scout member. The honor has been around since 1913.
has been required since 1917.
and the red, white and blue was for members. when the red,white and green was discontinued. the Thanks badge has been gold filled, metal. 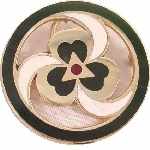 A miniature Thanks badge was introduced in 1972.
enamel around the outer edge. the triangle in the center. This was my Mother's leader pin from the 1960's. was in her late 60's. and the Brownie for being a Brownie leader. of the first official Brownie Packs. 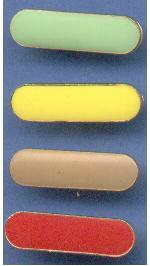 switching to an orange enamel in 1934. 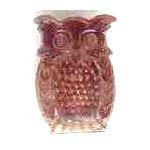 The Tawny Owl pin had a design change early on. 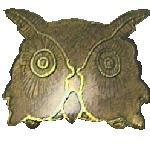 This pin is only 1/2"
the Brown Owl and Tawny Owl pins for leaders. - though that pin was larger. done in two or more geographical areas of a council. of Girl Scout Leaders and Co-Leaders. are attached to show additional training beyond that. All three are shown here. on the right side of the uniform. (over 18 years old, generally college girls). but not with the numerals. Miniature pins are for non-uniformed wear. 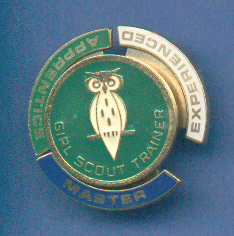 with the miniature membership pins. membership pin is not shown. Originally an optional item for adult uniformed wear, it also became optional on Cadette and Senior uniforms as well. 1973 cost - 50 cents.